This page is dedicated to my set up and progress as I stitch through: Country Cottage Needleworks "Main Street" series. I created my own border and I share it freely with you with my compliments! 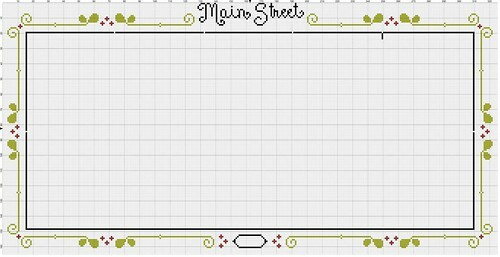 If you would like to stitch your "Main Street" using my border, just click on the photo, which will take you to my Flickr album. Once there - click on the "spyglass" and it will blow the photo up for you to visually see the STITCH COUNT and everything that you need to know. I cannot create PDF hard copies, I cannot sent PDF electronic files or anything else - as I created the border using a free software and it does not allow for me to make PDF versions. I stitched the border myself using my iPad and Flickr album. SO I know first hand, it can be done. Once again, I am giving this border of my own creation with my compliments. If you choose to use my border, as always, please give credit where credit is due by giving my name credit. Thank you! my piece of linen is cut 24 x 16 that gives about 3 inches margin top and bottom and a little over 2 inches on the sides FYI. I am using all the called for colors.